Langar is the name given to free community kitchen run by the Sikh Gurus and their followers. It is known as Guru-Ka-Langar. It is served to everybody without any consideration of caste, color, creed and status in the society. It is an important institution in Sikhism. Puran Singh calls Langar as a temple of bread for poor, needy and destitute. Where there is a Gurdwara, there is sure to be a free Langar attached to it. A Sikh Gurdwara without Langar is inconceivable. All the devotees and visitors who come to visit Gurdwara or attend Sangat (Holy congregation) in the Gurdwara, are provided with free Langar (Free Kitchen ). Sikh Langar is probably the most largely attended community kitchen in the world. It is a strong belief that the visitor to the Gurdwara must first sit in Pangat to partake Langar and then enjoy Sangat. Freshly prepared vegetarian meals are served in the Langar. The Langar contains Parshada (Roti), cooked vegetables, Daal, Khatta (Yogurt), Kheer (Rice pudding cooked in sweetened milk), Karah Parshad (consecrated food), Laddoos and Jalebis etc. This service is performed by the volunteers called Sevadars. Guru-Ka- Langar is prepared by the devotees themselves. Langar is placed before Sri Guru Granth Sahib prior to Ardas for blessings of God. It is served by the volunteers without any discrimination to the Sangat in Pangat (People sitting and eating Guru-ka-Langar together in a row). 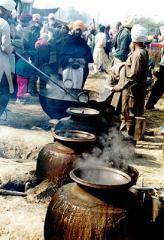 The community kitchen system encouraged the Sikhs to eat together in Pangat irrespective of caste, color and creed. In Langar, rich and poor, king and pauper, Sikhs and non-Sikhs, all share food sitting together in one row. The Sikhs feel it to be their honor to serve the travelers, pilgrims or other visitors to their homes or the Gurdwaras. Langar has led the followers to the path of equality, universal brotherhood, love and harmonious living. 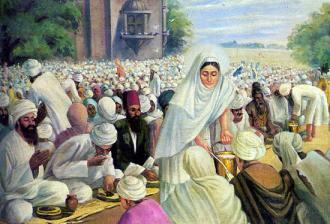 The Sikh Gurus used the institution of Langar as a powerful lever for equalitarian uplift of the down trodden community. The institution of Langar came into being in the times of Guru Nanak Dev when devotees used to attend to his discourses at Kartarpur. Guru Nanak Dev would use a little share of his agriculture earnings for his domestic affairs and would contribute the remaining towards service of Sangat and Pangat. Guru Nanak Dev introduced the system of community kitchen to eradicate the social barriers between high and low, rich and the poor, touchable and non-touchable, Hindu and the Shudra, king and the pauper. Guru Angad Dev Ji popularized and expanded the community kitchen as it was of great service to the outcaste, destitutes and poor people. 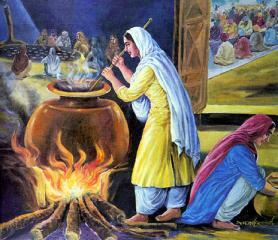 Mata Khivi, wife of Guru Angad Dev Ji prepared and distributed food with her own hands. Guru Amar Das wanted the visitors to shun caste system and create liberal views in their routine life. He made it obligatory for the visitors to go to langar first and then attend the Sangat or behold him. This created amongst the followers a feeling of affection, mutual harmony, fellowship and unity. Once Emperor Akbar came to meet the Guru and he had to first partake in Pangat (sitting in a row ) and then he could meet the Guru. The Langar system was run from the offerings of the faithful Sikhs. Whatever was daily received, used to be spent daily. Nothing was saved for the next day. The provisions in the Langar are voluntarily offered by the devotees and food is cooked by the volunteers while chanting hymns. It is considered to be an honor to do Seva in the Langar and serve the community. All rich and poor are treated alike in Langar. The service in community kitchen aims at doing away with ego. It inculcates a sense of human service, humility and humbleness. Langar serves as a strong bond of union within the community. It acts as a fair leveler and equalizer in the society. It gave a new direction towards Sikh sense of offering charities. According to Dr. Narang, “It taught Sikhs the first lesson of contributing money towards a common fund.” Langar played a significant role in India to eradicate caste system, untouchability, and other social and cultural evils. People of high and low castes sit and dine together in Langar. It created a sense of unity and oneness as preached by the Gurus. 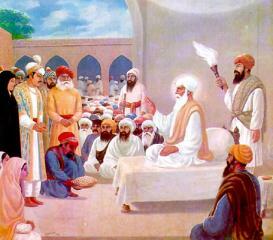 It was a powerful aid in promoting and spreading the Sikh religion. Langar manifests the principle that all are equal before God and equally entitled to the nourishment for body and soul.